What made you decide to write How to Hit a Curveball? Like most of us, I’d been thrown quite a few curveballs in the past ten years. Some professionally and some personally. And I realized that I wasn’t very good at handling them… certainly not as good as others who I could see were able to not just survive unexpected changes, but thrive. I decided I’d seek out these expert curveball hitters and learn their secrets. The more I interviewed and studied these people, and the more I learned about the process of dealing with unexpected changes, the more I also realized this wasn’t just an important skill to master, it was the most important skill to master today. The business world now is just one long series of unexpected changes. As a professional advisor to companies and individuals, I knew it was vital for me to teach others what I’d learned. You say we’re not born curveball hitters, we’re taught. Can you elaborate on this? Can anyone be taught? When we’re very young our parents understandably go out of their way to protect us from as many of life’s pains and problems as they can. And as we get older, our schools and public institutions do their best to smooth our way. Then, when we reach adulthood we find ourselves in a fully functional world in which things tend to work right: you flip the switch and the light turns on; you go to the store and they have what you need. As a result, most of us are not as resilient as people who’ve faced adversity early in life or who live in environments where things don’t always work as planned. The good news is that resilience is something we can all learn, without having to go through terrible traumas. In How to Hit a Curveball you describe the “process” of learning to a hit a curveball. What would you say is the most essential aspect of this process? Stepping up to the plate. It’s human nature to feel ashamed or embarrassed by being caught flat-footed and to want to conceal what’s happening from those closest to us. We’ve all heard stories of people who are fired but are so ashamed they don’t tell their families and instead keep acting like they’re going off to work every morning when actually they’re heading to the library, or Starbucks, or worse, a bar. Or we hear about the manager who loses a client and goes to extraordinary lengths to keep the news from reaching his or her boss. Procrastination, denial, and avoidance do nothing but extend pain and amplify problems. Revealing you’ve been blindsided removes the burden of shame and enables those close to you—at work and at home—to provide support, advice, and comfort. There seems to be a balance of left-brain and right-brain thinking in becoming a curveball hitter. Do you find the process is more welcome to the creative thinker or the more rational minded? Why? I think the process is more readily adaptable by the rational, left-brain thinkers. Right-brain thinkers, the creative types, want things to be intuitive and instinctive. But learning to deal with change really is a process, a discipline, not an art. It’s something you have to work at and practice, just like a baseball player practices his batting or a golfer practices her swing. Yes, there are some elements of the process that require creativity, but I’ve found that it’s easier for left-brain thinkers to occasionally be creative, than it is for right-brain thinkers to be rational minded for extended stretches of time. In my experience, an accountant can more easily write one poem than a poet can fill out a tax return. In today’s world of high unemployment, what’s the best advice you can give to someone who has recently been thrown the curveball of a layoff? Two things. First, be the batter, not the ball. Don’t beat yourself up with negativity. Set aside the nightmare visions. Don’t focus on worst case scenarios. Use your energy to make things happen. No one ever solved a problem by worrying. Just don’t fall into pessimism, but by all means be realistic. And second, step outside the batter’s box. Curveballs, by their very nature, are rarely solvable through conventional thinking. If you’re, let’s say, a car salesman who has just been fired, don’t spend all your time looking for another job selling cars. Odds are you weren’t the only one let go. Instead, think outside the box and look for other jobs and industries where your skills and abilities would be highly applicable and considered a plus. You work with major corporations every day about dealing with change. What is the biggest change companies have to accept to make it in the 21st century? That technology and communications are changing everything for both businesses and consumers. It’s not just that rapid advances in technology are changing the way we each do things; they are rewriting the business models on which entire industries are based. Businesses need to focus on what they do (and do best) and not fixate on how they used to do it. At the same time, businesses need to understand that consumers are going through the same transformation. People are focusing on what they want and adopting new products and technologies faster than ever before. Of all the people you’ve interviewed and featured in How to Hit a Curveball is there any one story that really stands out as truly inspirational? Why use a baseball analogy? Well, one reason is I’m a baseball fan. But more importantly, it’s because baseball has given our culture a rich and colorful language for describing all sorts of actions and behaviors. You don’t have to be a baseball fan to know what it means, in business or life, to strike out or hit a home run, to be a hall of famer or a minor leaguer, or to get thrown a curveball. Finally, how do you stay so positive when you’re in the midst of striking out? I’ve learned that most of the curveballs we’re thrown, while problematic or maybe even traumatic, are not apocalyptic. Setbacks are rarely ruinous, unless we choose to view them that way. 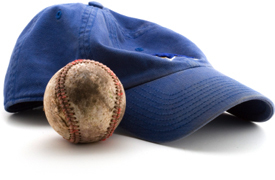 Curveballs are just part of life, and now, an increasing part of business. In baseball, the slate is wiped clean every time you’re at bat. You can strike out multiple times in a row and then come up in the bottom of the ninth and still hit a game-winning home run.